I'd like to make a ruined well obscured by rocks and foliage that leads to the underground home and workshop of a slightly mad map maker. He's trying to create a map of the island for use by some friends of his in a distant land, but he's a bit of a procrastinator and keeps going over the same spot of ground because he feels he hasn't mapped it right. This will be a reference to an update for a Morrowind Modding Guide I posted in reddit.com/r/morrowind, that I have yet to complete. He has a generally good relationship with the town guards and he takes up jobs fixing doors, moving things, and digging wells for people when he's not busy with his map making. I've made a bit of progress. I designed the entrance of the workshop which is made to look like ruined well that is part of what was once a small imperial outpost. I've also designed the inside of the well using rotated arches and have connected it to a small cave complex which feeds into the ruins of the old imperial outpost. This is where the map maker has set up shop. I still have a lot to do on the interior of the complex, but I have the basic layout of the place down. Sounds great. And an appropriate theme for your abode! Thanks, Melchior. 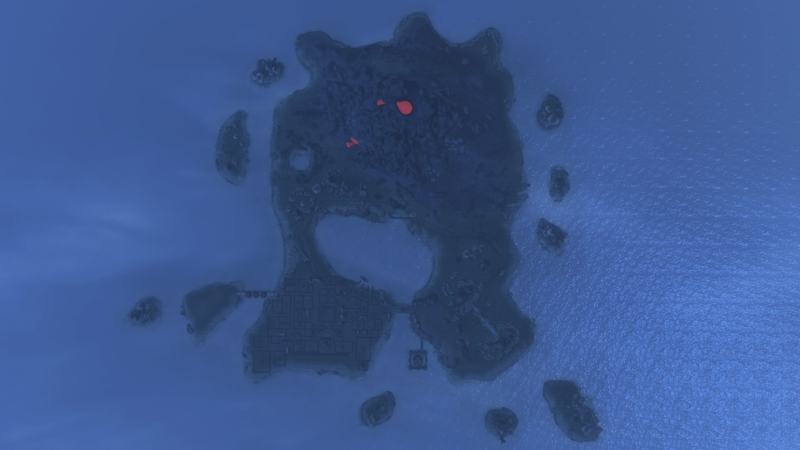 BTW, is there a map of the island I can use for my claim? I'd like to have a big incomplete map sitting on the table. Not of the whole island, no. I can get a picture of the whole thing looking down if that would help. That'd be great. The map's supposed to be rough/ incomplete. A little bit of progress. I've been doing a bit of interior decorating and whatnot. I still have some rooms to fill and I'm considering adding a small/medium sized ancestral tomb connected to the main interior, but I still have quite a bit to do before I get to that point. Brilliant use of vanilla imperial tiles to make that drop tunnel. I love what you've come up with so far. Here's on overview of the island. Things get wonky from that high up. Lots of z-fighting making things look strange depending on what angle the camera is at. I've run around the island a bit while test playing, and you've done a real nice job on it MD. Wow, my little island is bigger than I thought, in comparison to the rest of it. This is a great use of vanilla assets. And the rooms you have finished are very well detailed. This is really good work! This is perfect! Thanks a ton. Glad you guys like it, and no problem, cml. Note that only two of those interiors in the landmass file are mine though (some house on the bridge and then the crazy guy with the hole to jump in), the rest are by Darkelfguy.